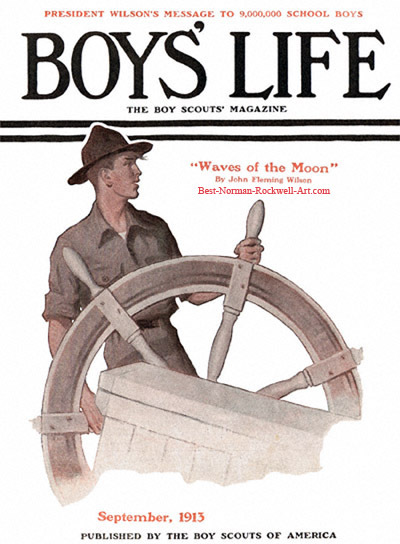 Scout at Ship's Wheel, this Norman Rockwell painting, appeared on the cover of Boys' Life published September 1913. This event marked Rockwell's first cover publication. Before the Boy Scouts magazine published this painting on its cover, readers had become familiar with him through his article and story illustrations. Rockwell had been the art director of Boys' Life since 1913. This was the 18 year old Rockwell's first job with a magazine. Boys' Life was a fairly new publication at this time. The first issue was published in 1911. No doubt, part of its early success was due to its fine young art director. Norman Rockwell painted this Boy Scout at the helm of a ship. He controls the direction the ship is heading with the wheel. Judging by the size of the wheel, the boat must be one of some size. The wheel is over half as tall as the Scout. Rockwell painted scenes from everyday life. No doubt, piloting a boat was a fairly common task for a Boy Scout. At this point in his career, he painted his scenes using models. He either found a ship with a wheel for his model to stand behind or he had a wheel constructed. Given that no other Rockwell works feature the same ship's wheel recycled in another painting, it is likely that he used an actual ship and wheel for this painting. Note also that this cover art is unsigned. For unknown reasons, Boy's Life covers up to that point were not signed by the artist. Rockwell, the fledgling cover artist, signed his first cover illustration the next month with October 1913's edition. His previous work for Boy's Life, article illustrations, had always been signed. He used the early "Norman P Rockwell" signature in those illustrations. He later dropped the "P" since he didn't like his middle name, Percival. Also featured in the September 1913 edition of Boy's Life were several article and story illustrations by Rockwell. The art director's career was well on its way.